Celeste Brown reclined in a dental chair, holding the handle of a paddle-shaped mirror. Then she did something that she used to avoid at all costs: She smiled. Her teeth looked beautiful. Dr. Frederick Marra of Cohoes, N.Y., shows makeover winner Celeste Brown her new smile for the first time. "I never thought this day would come," Celeste said in a quietly awed voice. Just moments before, Dr. Frederick Marra of Cohoes, New York, had put the finishing touches on her Ultimate Smile Makeover. More than a decade of physical and emotional suffering had just come to an end. "I entered the contest thinking it would be a dream," Celeste said, turning to Dr. Marra, who was seated at her side. "When I actually won, and I met you, and you did what you did for me, my whole life changed. And today, I'm a different person because of you, and I thank you for everything from the bottom of my heart." Dr. Marra patted Celeste's shoulder and said, "You're welcome, it's been my pleasure." He noted that she not only had a beautiful new smile, but also was now in excellent oral health — a far cry from when he first met her more than a year earlier. "The life that you'll live right now is going to be the best quality of life with regard to your dental health," he said. "You know, a smile means everything — to you inside and to people on the outside — and you have that now, and that's great." Fig. 1: Celeste's periodontal disease caused gum recession and bone loss, the full extent of which can't be seen without x-rays. Fig. 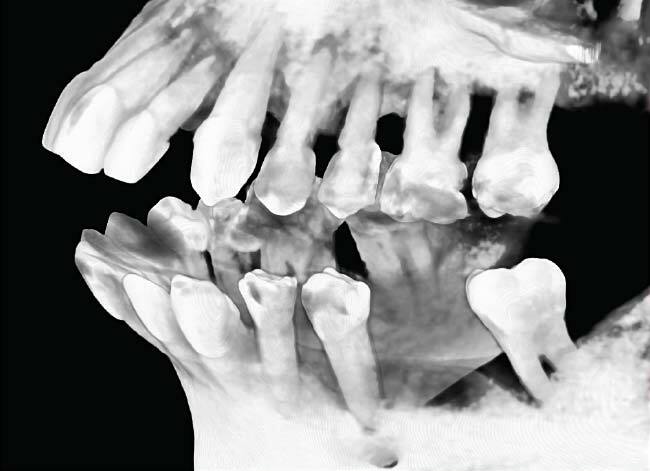 2: CAT scan x-ray imaging reveals extensive loss of tooth-supporting bone. Gum disease can cause extreme bone loss, even when gum recession appears minor. 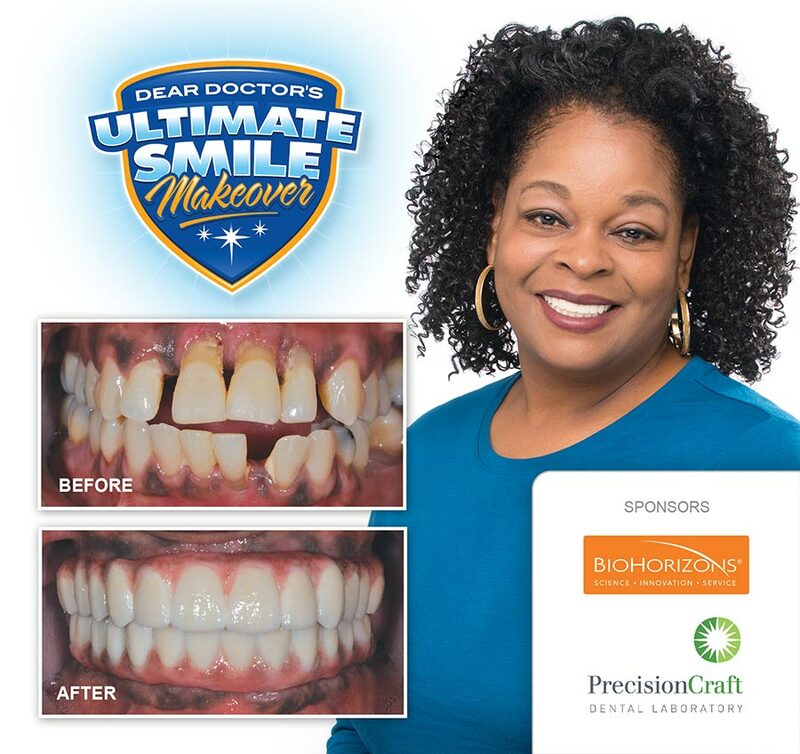 Having the best quality of life is not something Celeste could have imagined the day she entered Dear Doctor's Ultimate Smile Makeover contest. She was suffering from advanced periodontal (gum) disease, a serious condition that is caused by certain types of oral bacteria. The disease had loosened her teeth and made eating a struggle. Celeste had a particularly difficult time with cold foods: She couldn't bite with her loose front teeth, so she needed to bite on the side. But the disease caused the gum tissue there to shrink. This exposed the roots of those side teeth, making them overly sensitive to cold. What's more, Celeste was self-conscious about the widening gaps between her teeth and therefore avoided speaking and, especially, smiling in public. She knew she had to do something… but what? "It was a day where I was just depressed," she recalled. "I just came from a dental appointment and I knew I couldn't afford the treatment I needed. So I got on Google to see what other people did." Finding out about Dear Doctor's Ultimate Smile Makeover contest, also sponsored by BioHorizons implant company and Precision Craft Dental Laboratory of Smithfield, Rhode Island, gave Celeste a ray of hope. "I never thought I would win," she said, "but I figured I'd take a chance." She entered the contest every day, and her persistence paid off. Celeste was eventually selected as one of 10 finalists. That was exciting news, but it would only get better. She eventually received an unforgettable call from Dr. Mario Vilardi, the president of Dear Doctor. "Dr. Vilardi called me and he said 'Celeste,' and I said 'yes,' and he said 'are you sitting down?' I said 'I could be.' And he said, 'I just want to tell you that you won.' Just to think about that day — that's the best day of my life," she recalled in a voice choked with emotion. "He made my whole day, my whole world, everything changed." To start the makeover process, Dr. Marra performed a complete oral examination aided by three-dimensional digital x-rays, photographs and models he made of Celeste's mouth. 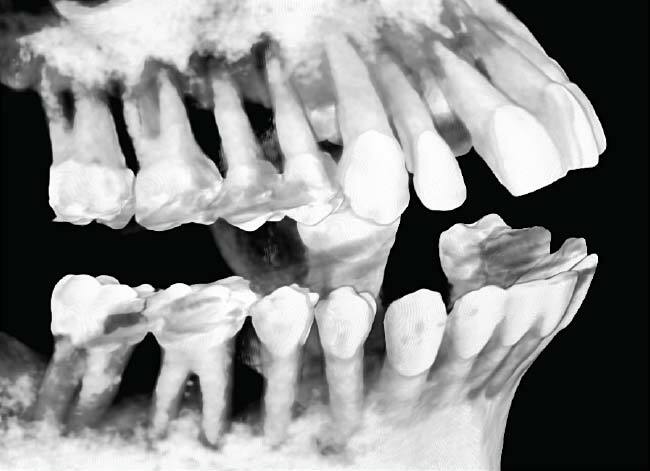 "The first thing that I noticed in my initial examination and evaluation was that her front teeth had moved significantly from their original position," Dr. Marra said. "In advanced gum disease, patients lose vast amounts of the bone that supports and holds those teeth in place." Fig. 3: This CAT scan image of Celeste's left side shows Celeste's extreme bone loss. Fig. 4: This CAT scan image of Celeste's right side also shows extreme bone loss. With so little bone left on all sides, Celeste's teeth were becoming too loose to function properly. Dr. Marra explained that because the disease had eaten away so much of Celeste's supporting bone, her teeth were in danger of falling out; painful abscesses might also develop. Then there were the risks to her overall health. 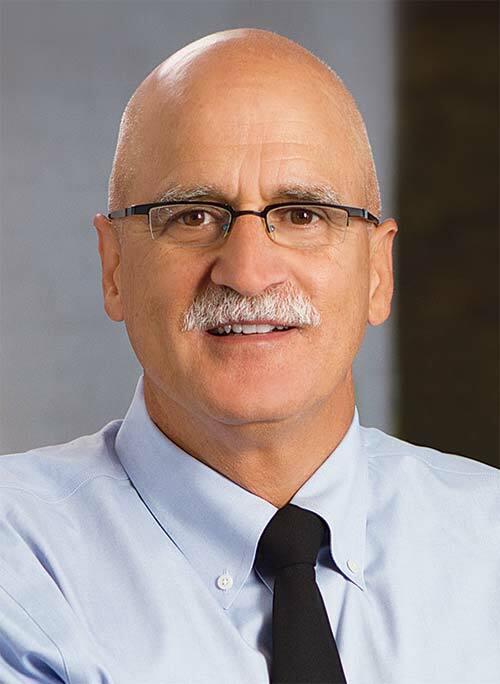 "Today we know that having gum disease plays a role as a risk factor with cardiovascular health and in a number of other different arenas with regard to our general health," Dr. Marra said. "Based on the advanced nature of Celeste's gum disease, the only way that I saw to rid her of that gum disease was to remove her teeth." The question then became, how would her teeth be replaced? Dr. Marra decided that the best solution for Celeste would be an entire new set of custom-made prosthetic teeth supported by dental implants. Why dental implants? This high-tech tooth replacement system offers a number of advantages over traditional methods, such as dentures or bridgework supported by natural teeth. Dental implants themselves are small, screw-shaped posts that are inserted directly into the jawbone in a minor surgical procedure. They are made of titanium metal, which over time becomes fused with the living bone cells in the jaw. 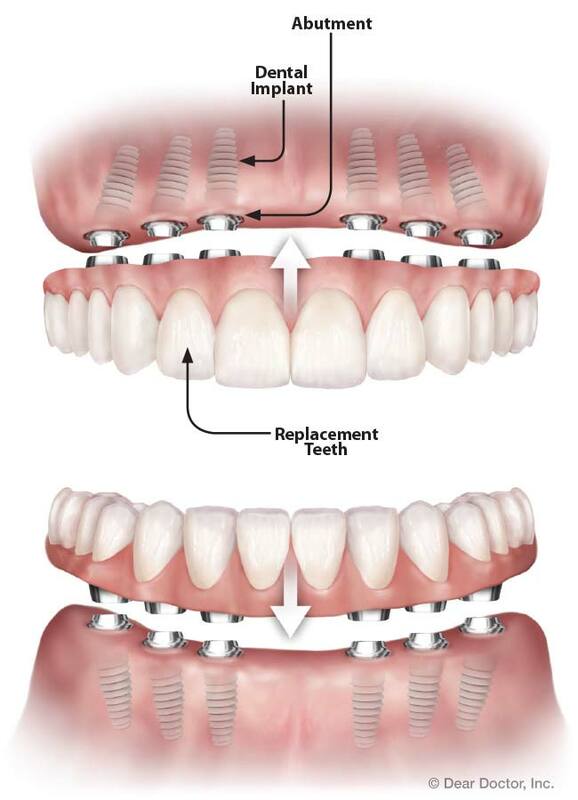 That's what allows implants to function like the roots of natural teeth, anchoring a row of highly realistic replacement crowns (the visible parts of the teeth) solidly in place. "What's great about this treatment is it brings you back — as close as one can deliver — to your natural teeth," he explained. "Dentures aren't a replacement for teeth, they're a replacement for no teeth. They never give you what you had before. This is pretty much having what you had before." The BioHorizons company generously donated 12 dental implants to the makeover as well as all of the implant component parts. Dr. Marra would ultimately place those implants in the bone beneath Celeste's gums, and then attach the new teeth. But first, there were a few more steps that had to be taken. Celeste's makeover took a lot of planning and coordination between Dr. Marra and the highly skilled technicians at Precision Craft Dental Laboratory, who created the replacement teeth for Celeste. First Dr. Marra removed Celeste's loose front teeth, which had moved out of alignment, and could not be preserved. 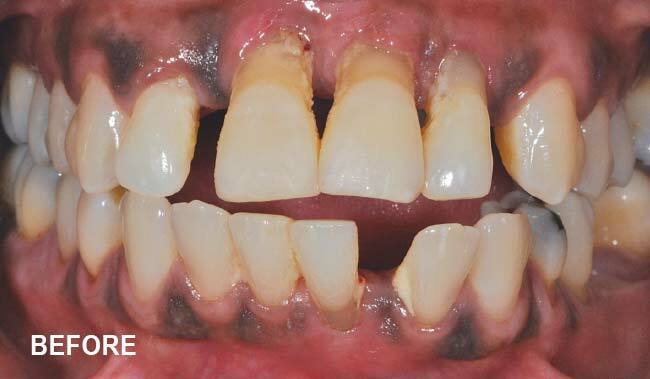 He then replaced them with a temporary bridge that had two acrylic teeth in the correct position. "It gave me an opportunity to confirm with her that she was happy with where we were ultimately going to place her teeth," Dr. Marra explained. "It also gave an opportunity for the lab to see where I wanted her teeth to be placed." After Celeste had worn the temporary bridge for several weeks, Dr. Marra took dental impressions of Celeste's mouth and sent them to Precision Craft, along with other information about Celeste's bite. The lab then fabricated a clear plastic surgical guide that would mark exactly where her implants should go, along with a set of temporary teeth for Celeste to wear after the procedure. Then it was time to remove the rest of Celeste's failing teeth and place her dental implants — six in her upper jaw, and six in her lower jaw. The procedure also involved a bone graft. Dr. Marra placed laboratory-processed grafting material in the sockets where Celeste's teeth had been, to fill around the implants and help her body build new bone in her jaw to support her new teeth. Bone grafting is routinely done when the existing bone does not have enough volume to optimally support the implants. Dr. Marra also drew some blood from Celeste to obtain cells known as "growth factors," and placed this material in the sockets to spur the growth of new bone. "The combination of the bone grafting and growth factors stimulates bone formation there," Dr. Marra said. "It worked very well for Celeste." Celeste was sedated throughout these procedures. "It was fabulous, I didn't feel anything," she said. "It was like I was sleeping." Celeste received a full set of new teeth supported by 12 dental implants. When she woke up, she had all new teeth. 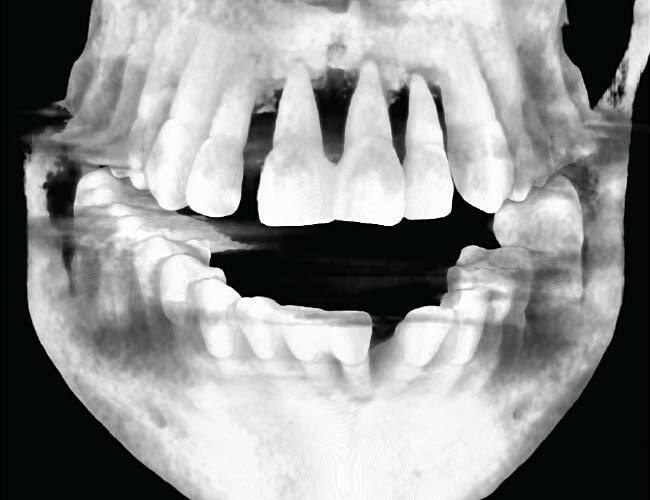 "She left that day with two new sets of teeth, upper and lower, in her mouth," said Dr. Marra. "Her smile looked great and other than being a bit sleepy, she was fine." These were not Celeste's final teeth; they were a temporary (but functional) set designed to be used for a few months, while new bone continued to form around her dental implants. Plus, gum tissues can shrink slightly during healing, so the healing process has to be complete before accurate measurements can be taken for the final set of teeth. Yet Celeste's temporary teeth started to change her life immediately. Dear Doctor checked in with her while she was wearing her temporaries, and she said she was enjoying food for the first time in years. "I can eat anything," she declared. "I don't have cold sensitivity — they're great!" As for formerly impossible foods like steak and apples, she said, "I plow right through it! I love it! I chew right through nuts — everything." Celeste also began interacting with people more. Soon, her employer moved her into a position at work with very different responsibilities. "My new job requires me to manage my whole department so I'm interacting and engaging with people all day," she said. "And with that interaction, I'm able to talk more freely, smile more, and communicate with people. And so far it's going well, they think I'm doing a great job." Still, Celeste's smile was not yet perfect: The temporary teeth were not as highly customized to fit her mouth and facial features as her final teeth would be. Several months later, Dr. Marra determined that Celeste's implants were securely integrated with her bone. He took more impressions of her mouth and sent them to the Precision Craft laboratory so they could create her final teeth. When her final set of teeth were done, Celeste went back to Dr. Marra's office. In a procedure that required no sedation or anesthesia, he removed the temporary teeth and attached the final ones. That's when Celeste looked in the mirror and saw her fully remade smile for the first time. Soon she became ecstatic. "I love it, I absolutely adore it!" she exclaimed. "I can't wait to show it off!" Celeste said her smile makeover had brought about a change on the inside as well. "I feel more outgoing," she said. "I want to engage with people more now. And I want people to see my smile. Today I want to be in your face — I want you to see me!" Celeste said her new teeth looked and felt just like the healthy teeth she once had as a young woman. "They feel like natural teeth," she said. "It's like I never lost my teeth, to tell you the truth, because they feel wonderful." A Dear Doctor staff member then handed Celeste a celebratory ice cream bar. Once upon a time, eating that frozen treat would have been a painful experience. On this day, she enjoyed every bite. When Celeste won the Ultimate Smile Makeover, Dear Doctor needed to partner with a dentist who had the necessary skill and expertise to plan, coordinate and carry out multiple procedures to restore her smile and her oral health. Fortunately, the ideal one was nearby: Dr. Frederick Marra of Cohoes, New York. "Dr. Fred Marra is one of the finest dentists I know and he always will place the needs of a patient first," said Dr. Mario Vilardi, president and publisher of Dear Doctor. "He also has a big heart and he's willing to help people less fortunate." Dr. Frederick J. Marra is a 1980 graduate of the University of Pennsylvania School of Dental Medicine. He began practicing with his father, Dr. Harry W.L. Marra, in 1981. Since then, Dr. Marra has completed hundreds of hours of continuing education courses in dental implant placement and orthodontics. He has earned a mastership in the Academy of General Dentistry and a fellowship in the International Congress of Oral Implantology. Celeste couldn't have been more pleased with the care she received from Dr. Marra and his team. "Dr. Marra is a great person," she said. "He's very friendly, he's very caring. He's the best doctor I know. I really, really appreciate Dr. Marra." Likewise, Celeste said Dr. Marra's staff was top-notch. "His staff is great, they're very friendly," she said. "When I come here I feel like I'm part of the family. It's a team. They care about you. They don't just want to take care of your mouth, they actually care about you, and that means a lot to me. I think the care here was awesome. I couldn't ask for a better team." Dr. Marra said he was very pleased to be able to participate in Dear Doctor's Ultimate Smile Makeover. "Being able to give back and to provide a new life for somebody is always a rewarding experience," he said. Learn more about Dr. Marra by visiting www.marradmd.com. Learn more or enter our latest Ultimate Smile Makeover by visiting www.DearDoctor.com/makeover.